Photos courtesy The Japan Foundation. We try to avoid mentioning events that cost this much, but Cinema Kabuki is a very rare and special opportunity. Book your tickets soon. Feb. 23 6.00 pm Heron Maiden & 8.00 pm Hokaibo. 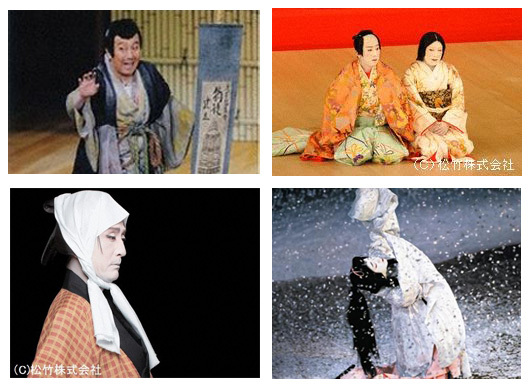 Last summer the Japanese Foundation hosted a marvellous two-day lecture series on Japanese theatre with Dr. Michiko Hirama. You can find my review on http://bit.ly/yu6ZRn . The Japan Foundation also promotes theatre on the large screen annually. Above is the line-up for this year’s extravaganza at the Scotiabank Theatre (Richmond and John Streets). The shows are so important, it encourages Japanese women to wear traditional kimonos to the event. I’m not Japanese but I will be wearing one of my Japanese haori or jackets. Of course, they won’t turn you away if you’re not wearing Japanese clothes. At the lecture, the Foundation announced that it was bringing Bunraku, the ancient art of puppetry to Toronto for the first time. The schedule includes Murder in a Hell of Oil using these wooden puppets. Cleverly manipulated, they are very magical with up to three puppeteers per puppet. I very much look forward to this performance. The story is moralistic. It is about a ne’er-do-well who succumbs to greed. I also deeply anticipate the full Heron Maiden performed by the internationally renowned onnagata or male actor specializing in female roles, Bando Tamasaburo. He portrays a mystical woman who instantaneously can change herself from a bird to different types of women. Tamasaburo does this magically on stage within minutes through his fine movements and character. The Zen Substitute is described as a dance comedy and addresses deceit and how one couple makes up. Apparently the two dancers are currently known as the best Kabuki dancers in the world today. That alone makes it very worthwhile viewing. On a more pensive note, Hokaibo is a story about a monk who deceives his devotees. He uses their donations for personal gain. Typical of Japanese folklore, this film is set in a mystical world where the monk is changed into a ghost that haunts those living in Samurai times. Tickets cost $15 for Heron Maiden as it is half an hour, and $20 each for the rest. : http://www.cineplex.com/Events.aspx . You can also buy them at the box office.